The goal of BattleZONE is to train, equip and multiply male disciples for Christ...or as Jesus said in Mathew 28:19-20, "Go out and train everyone you meet, far and near, in this way of life, marking them by the baptism in the threefold name: Father, Son, and Holy Spirit. Then instruct them in the practice of all I have commanded you. I'll be with you as you do this, day after day after day, right up to the end of the age," (MSG, Emphasis by Michael Pouliot). Our Mission... is to transform the hearts of men to follow Christ and become generational disciple makers. Our Vision...is to train, equip and multiply hundred's of disciple-making disciple makers in the next 10 years to become leaders who expand this process in their area of Christian service. 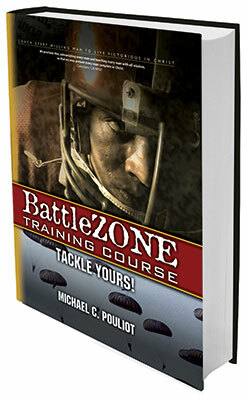 The GOAL of BattleZONE is to train, equip and multiply effective disciples for Christ.